PA900 – July 2018 Product of the Month! July’s Product Of The Month is the PA900 Precision Multi-Channel Harmonic Power Analyzer! Each week we will post a tip or feature about the PA900 on this page as well as through our social media outlets! Be sure to follow us to learn about the PA900! Vitrek – PA900 – Did You Know…. 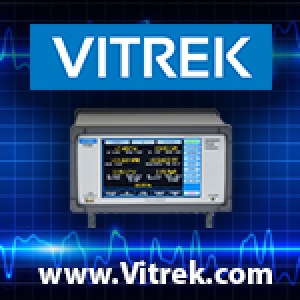 The Vitrek PA900 can be used as an oscilloscope for Voltage & Current Waveforms? Click here for info! The PA900’s custom screen capability allows users to show/hide results they wish, color the results and set the font size and add user text to meet their individual preferences. No other power analyzer is as user friendly & customizable! The Vitrek PA900 has the ability to inter-connect up to 255 units for complex multi-channel systems. This is particularly important when an application requires a four or five channel system…plus motor transducer measuring capability!